LG Optimus L7 has Android 4.0 Ice Cream Sandwich which was least expected, for a phone that is priced so low when compared to other phones using the same operating system. Instead of the Qualcomm Snapdragon S1 1GHz CPU, LG could have opted for dual core or quad core chipsets, the S11GHz CPU is good for standard definition features when it comes to HD a quad core chipset would be more recommendable. With a maximum resolution of 800 x 480 this phone does not support anything more than 720p. The 4.3” screen is perfect for watching videos and playing games. Below the screen you can find a physical home-key, a menu button and a back button. On the top left you have a front facing light sensor with a VGA camera. On the head of the phone there is a 3.5mm jack for headphones along with the power key. The power key is a little difficult to get at with one hand, due to the angle and the curve of the phone. On the left side of the phone you will find the volume rocker which is barely visible, it is like an optical illusion and the volume rocker is cleverly concealed. On the base of the phone there is a USB port (micro) and the microphone. On the back there is a 5 megapixel camera with a LED flash and towards the bottom you will find two grilled slits for speakers. The L7 has an inbuilt antenna and supports a full-size SIM Card. There is a slot for microSD card (32GB) to add to the 4GB internal storage. 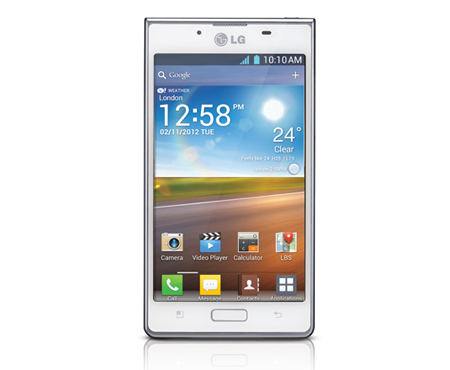 LG Optimus L7 uses a 1,700mAh battery; this battery gives up to 350 minutes talk time and up to 600 hours of standby. On the results based on a stress test, the battery was ranked average when streaming videos or playing games the battery drains quickly. With all the power saving options enabled and the brightness reduced to a minimum, the phone will need a charge before the end of the day. One of the most appreciable features of this phone is that you do not have to remove the battery every time you have to change a SIM-Card or place a microSD card, you can place them without removing the battery. LG Optimus L7 certainly scores full points for looks, features and substance, though the screen resolution and battery life can be a minor drawback. This phone is reasonably priced and is a good smart phone to have.